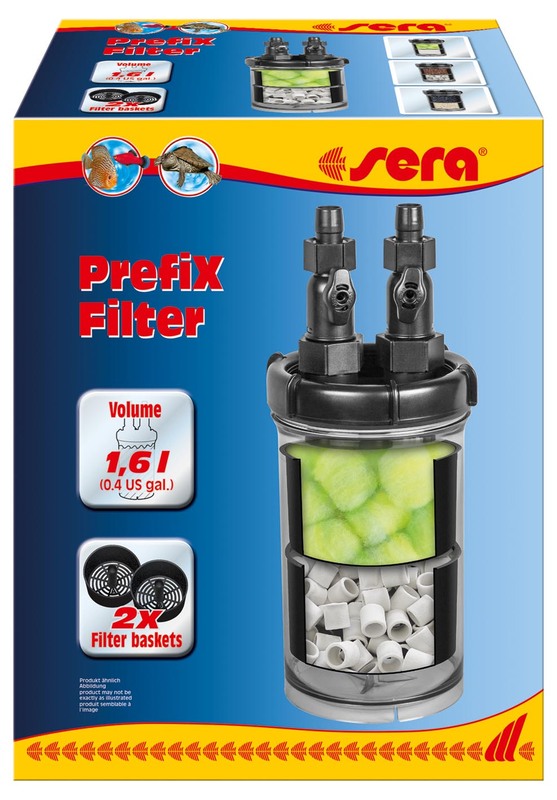 sera’s new PrefiX Filter is a non-motorized media container that can be used to expand the filtration volume and capacity of existing filter systems. Looking to increase the capacity of an existing filtration system? Sera’s motorless PrefiX Filter can be plumbed inline, on the intake or return of an external filter, to add additional media compartments and generally increase the capacity of the existing filtration. Heinsberg, Germany – Flexibly useable and simply convenient: the new sera PrefiX Filter is ideally suitable for various applications, and is a useful addition to an already existing external filter. The new sera PrefiX Filter can be used in case the volume of a filter is not entirely sufficient. It includes two filter baskets that can be variably used and equipped and enhances the filter volume by up to 1.6 liters (0.4 US gal.). The motorless filter can be connected to a pump or an external filter by means of a hose (Ø 16/22 mm). It is also possible to connect several PrefiX Filter in series and thus increase the filter volume. The sera PrefiX Filter provides various applications: as a prefilter in case of cloudiness, as a quick filter in case of strong pollution or as a biofilter for enhancing the filter capacity of small external filters.